The Flying Fur Balls are star acro-cats, drawing huge feline audiences. 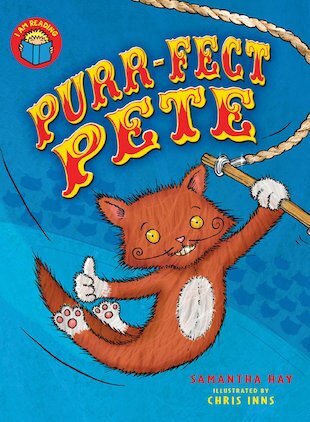 The latest recruit to the Fur Balls, Pete, is amazing – until the night he is fired out of a cannon onto the high wire. As he lands, his fur catches alight, forcing him to unzip his ‘skin’ – and then the truth is revealed: Pete is really a mouse! The other Fur Balls have to protect Pete from a furious audience – but the next week, he buys a new catsuit and relaunches his career! A hilarious reader with vibrant colour pictures throughout, bridging the gap between picture books and chapter books.